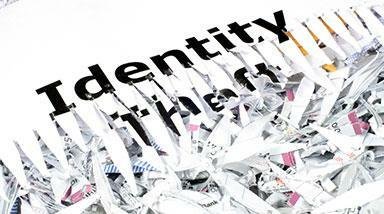 The biggest threat in the United States when it comes to property crime is identity theft. It surpasses all other property crimes combined with a total of over $10 billion dollars in losses. With that in mind here are five easy steps that will help you protect your identity. Use silly answers for security questions. The easiest way for identity thieves to gain access to your banking, email, or any other accounts isn’t to know your password, but to guess the answer to your security questions. The high school you graduated from, the street you grew up on, or your mother’s maiden name are pretty easy pieces of information for a hacker to find out, but if you give a nonsensical answers to those questions like “spaghetti” or “xylophone”, there’s no way anyone can guess them. Last year, income tax identity theft cost the IRS $6 billion. On top of that, the victims had their refunds delayed by around 278 days. The criminals behind this sort of identity theft get away with it by filing fraudulent tax returns before their victims do. With that said, the easiest way to avoid income tax identity theft is to file your taxes early. Keep your anti-virus and anti-malware up to date. At this point, we all know to have this software running on your computer and smartphone, but keeping them updated with the newest security patches is essential to staying protected. These updates can keep you safe from new threats, but people should still be smart when checking email and never click on links or download attachments unless you are confident you know where it came from. Use a credit card with an EMV chip. These chips are far more secure than using the magnetic strip, which can be stolen by thieves using a credit card reader. These devices can be installed at gas pumps, ATMs, grocery stores, and pretty much anywhere a credit card can be swiped. When a victim swipes their card through one of these readers their personal information is taken and criminals can then make a duplicate card. Using the chip keeps that from happening. In addition, only use debit cards at ATMs located at your bank. There’s more liability protection for customers on stolen credit cards than there is on debit cards. Even if you do spot fraudulent activity on your debit card and report it, it’s like likely your bank account will be frozen while it is being investigated. Put a credit freeze on your credit report. Many people have heard about putting a fraud alert on your credit report to protect again identity theft, but in reality doing so offers very little protection. If you really want to deter potential identity theft, put a credit freeze on your credit reports with the three major credit reporting firms, Experian, Equifax, and TransUnion. Doing so will stop criminals from making large purchases even if they have your social security number. Identity theft is not only a crime that can potentially have a huge economic impact, but it can also be a major inconvenience while it is being resolved. Following these steps should help keep you just a little better protected.